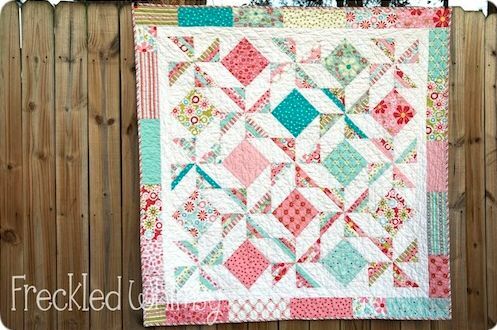 This one looks like a nice easy one to put together, grab the PDF file from Sew, Mama, Sew. The only problem you will have is choosing which yummy fabrics to use, have fun. 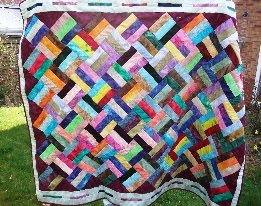 Check out this great runner over at "Sonnet of the Moon" blogspot, so fresh and pretty. Crystal has done a great job of the Tute and lucky me has some of that delicious red fabric in the center and binding, I have plans to make a bag with it but I'm sure there will be some leftovers to make one of these. Have you been collecting Jelly Rolls like I have been? 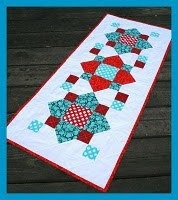 Wondering what to do with them....there is a pattern over at Ludlow Quilt and Sew that looks simple enough to whip up. it's so fresh and pretty so thought it was a good one to share with you all, pop over to here to check it out. This is a very off topic post on the Freebies blog today. I have been caught up with the devastation of the Qld Floods here in Australia so am sorry I am not posting any freebies of late. If you are interested in reading more on the floods you can pop over to my SEW PRIM KHRIS blog to read about it. My home town of Ipswich has been hit hard and the capital of Queensland "Brisbane" is suffering hugely along with 70 other towns/cities throughout Queensland.